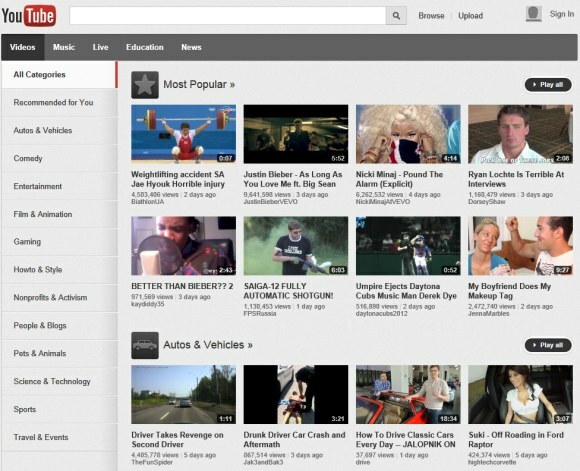 YouTube continues to test new homepage interfaces focused on popular topics. YouTube's topic pages look like channels, but they're automatically generated by YouTube using videos that are related to a topic. 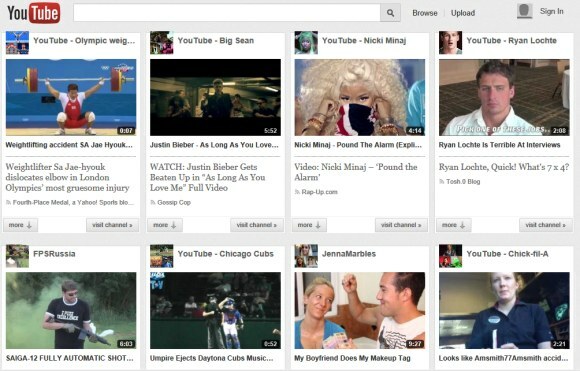 The homepage also shows videos from popular channels. 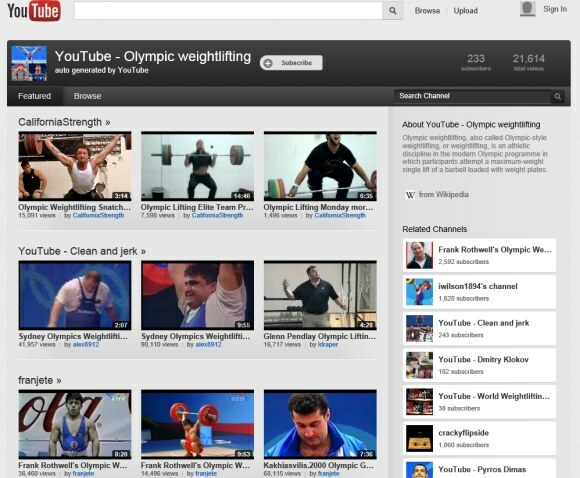 All the links that start with "YouTube -" send you to topic pages for things like "Olympic weightlifting", "Gymnastics", "Driving under the influence", "James Bond Film Series" or "Chick-fil-A". Click "more" to see more videos from the channel or topic page. The new UI experiment is very similar to the "carousel" interface I've mentioned last month. It only works when you're not logged in and YouTube redirects you to a new page: youtube.com/lohp. Then press Enter and close the console. Go to youtube.com/lohp to see the experimental interface. Update: There's also an experiment that redirects users to the "videos" page, which shows popular videos from various categories. what you say in your update,is false, that page existe since more that year, most popular video, and recommendation for every topic! it what happen when you tap "Browse"!!! I don't think there's something false in this post because I've actually checked everything. If you're referring to the last paragraph, what's new is that YouTube redirects you to the "browse" page when you visit the homepage. I didn't claim that the page is new. Youtube's home page just abruptly changed for me to a *mood* wall interface - where I could browse video thumbnails by selecting a mood (Creative, Brilliant, Epic, Strange, etc.) A running History of my thumbnail choices appeared as text links at the bottom of the home page. 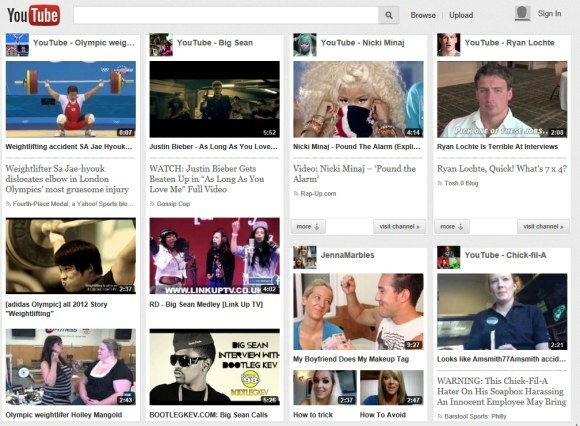 It seemed far too primitive an interface for a complex site like Youtube. Since I was *not* logged into my Google account at the time, I am wondering if I just got hacked (DNS hijacked, spoofed, account break in, etc.) Is there an Youtube experiment like this going on right now? Alright I got a new youtube interface. To enable it you have to Be Signed Out and type in(Without the quotes) "document.cookie="VISITOR_INFO1_LIVE=NkqBDupucDg; path=/; domain=.youtube.com";window.location.reload()." Then you will see the new interface.The link is still the http://www.youtube.com/lohp, but it looks different than how it looked before.